As the Super Bowl approaches we continue to find things to get excited about. 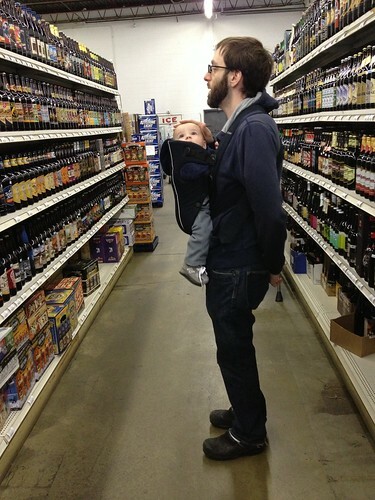 Neither of us cares about football at all but, for some reason, we look forward to the Super Bowl each year. I, as you may know, am a big fan of any day or event that gives reason to make very specific foods. This year, however, I will attempt to make a dinner that does not include a "Buffalo" version of anything. In anticipation of the big game Elliott has taken to doing his impression of the Goodyear Blimp. It's pretty spot on if you ask me. It's all about the subtleties of his movement. Jen and I have chosen to prepare by watching hockey every night and sort of not knowing who is actually playing on Sunday. While I don't really care about the commercials it is actually pretty interesting as this is the only time of the year I ever see commercials. It's intriguing to know that they still exist. For dinner tonight we gave the Wombats their first taste of pears. 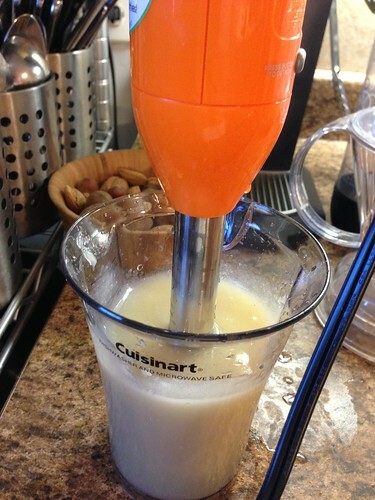 We purchased them last week but they were finally ripe enough to puree with the immersion blender. They were very juicy so I added a little bit of oatmeal for consistency. Jen's mother hates pears. She distrusts them thinking they only exist in nature to trick people into believing they are apples and subsequently disappointing them. Sadly for her I think we have a new leader in the food race. 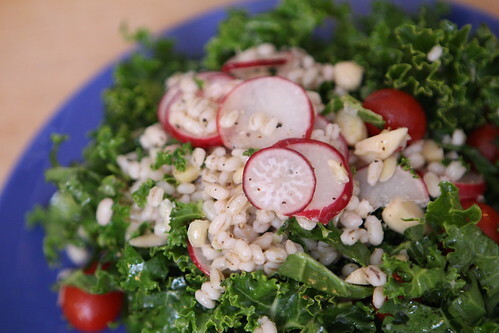 For salad I made this nice healthy salad of kale, barley, tomato, almond, radish, lemon, olive oil, salt, and pepper. There is nothing more virtuous than eating a giant plate of raw kale. It makes you feel like you have earned pork. For the main course I made another virtuous meal of the ancient grain freekeh. It's amusing to me that it's such a modern trend to feature ancient grains that have been around and in use for a minimum of 6,000 years. So trendy. 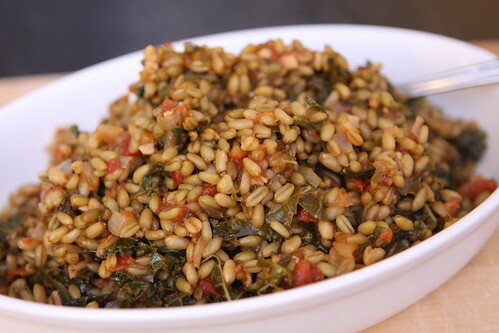 I cooked the freekeh and added it to some browned onion and garlic, kale, diced tomato, paprika, cumin, hot sauce, lemon, olive oil, salt, and pepper. This dinner was tasty, wholesome, and a great excuse to eat a mess of pork belly at some later date. 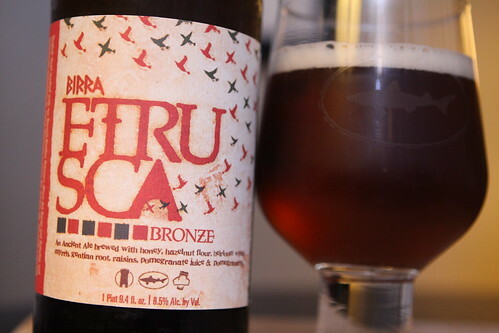 To go with this ancient grain I decided to crack open this bottle of Birra Etrusca Bronze from Dogfish Head. This is the latest release in their ancient ales series. For this beer they traveled to Rome with molecular archaeologist Dr. Pat McGovern and analyzed data from the drinking containers from 2,800-year-old Etruscan tombs. They tried to recreate the beers drunk by ancient Etruscans with this particular beer. I'm a bit ashamed to admit that these stories always intrigue me and get me excited to try their beers. I'm even more excited to try their beers now that Jen got me these super-sweet Dogfish Head Signature Glass. We picked this up the other day at the beer store where Jen read the ingredient list off the bottle (honey, hazelnut flour, heirloom wheat, myrrh, genlian root, raisins, pomegranate juice, and pomegranate) and declared that she was very skeptical of it. Understandably so. It was very good but much more like wine than I'd have expected. Another thing Jen is skeptical of is my new love of Vine. She doesn't believe that it adds anything to pictures of beer. I disagree. It adds something very important . . .
A plateful of kale reminds me why cows have multiple stomachs.